Patient engagement is such a core value of a high quality, low cost, patient centered health care system that I thought everyone understood it by now but clearly there is work to be done. 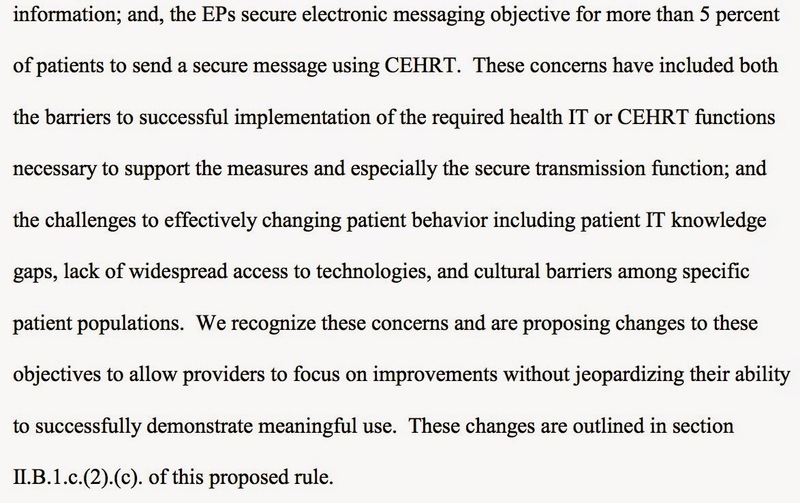 Although it is still just a proposal - CMS is suggesting that they essentially remove any real patient engagement from the already low 5% to a token 1 patient for View, Download or Transmit and an either/or test for Secure Messaging. It might just seem like a wonky proposed rule buried in the Federal Register but patient centered care is a core principle of our health care system and if we really believe that patients are part of their own or their family member's care they need the same access to information as the rest of the care team. This isn't just about "data" it is about treating patients as full members of their care teams. 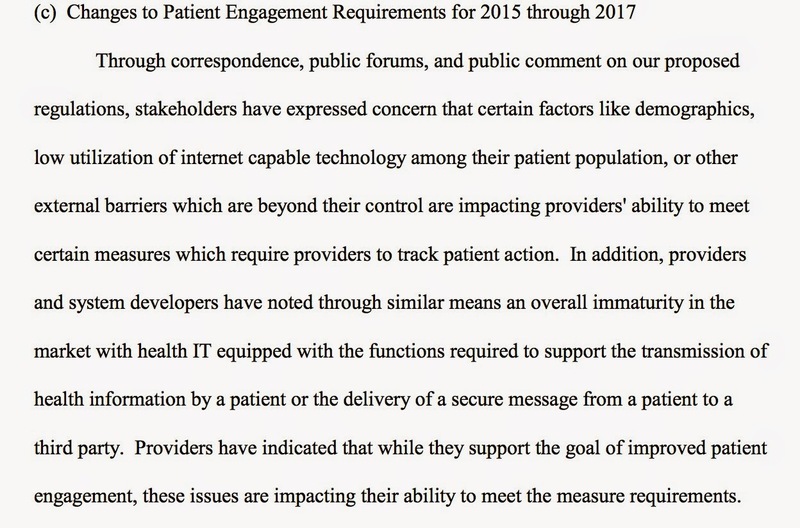 We also know that this is something that patients want -As far back as 2011 when we were developing MU Stage 2 rules "73% of Americans surveyed would use a secure online communication solution to make it easier to get lab results, request appointments, pay medical bills, and communicate with their doctor's office." It is also easily achievable IF you combine an active patient engagement strategy versus simply turn on the portal and expect patients to find value in it. We also know it works from large systems like Kaiser to rural providers (case studies on ONC web site) when doctors lead the way. 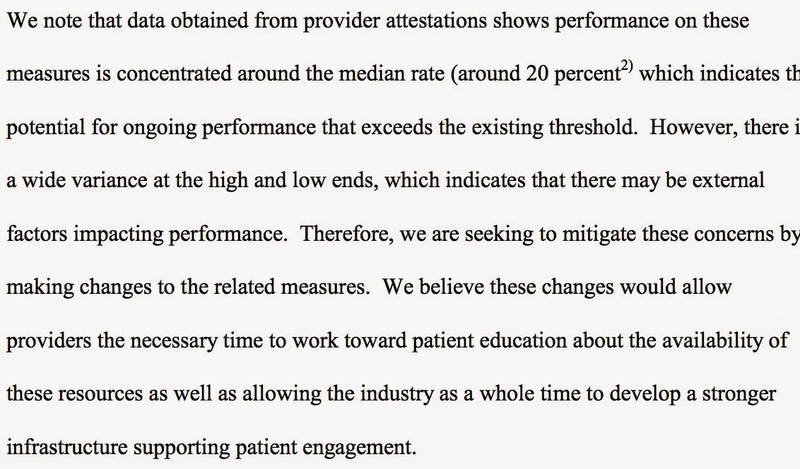 Sadly it appears a few very loud doctors and a perhaps a few powerful organizations (looking for the link to the comments behind this change) pressured CMS to change the rules for stage 2 to essentially drop patients from being key members of the healthcare team. Once the proposed rule is officially published on April 15th we will be able to make comments but clearly they need to hear from patients. Perhaps we should propose a sliding scale payment? If you have 1% of patients engaged you get 1% of payment all the way up to 100%? Here are the key sections. So this rule change is a HUGE surprise and disappointment and not in alignment with a patient centered health care system where patients are treated as full member of their care teams.